Nobody likes a copycat. Everyone feels a little threatened by someone who imitates us a little too closely, but, of course, never as well. Instinctively, we all know that what we do is somehow cheapened if someone else also is doing it. On the other hand, there is something fascinating about the idea of the twin, an exact copy of a person or thing in every way and yet, somehow different. There are many variations — the ordinary twin brother or sister, the clone, the evil twin, the doppelganger — that raise serious philosophical questions. We don’t usually think about these subjects. Most of us take our unique identities for granted, but the existence of someone who looks and sounds exactly like you raises doubts about the nature of identity and knowledge. How do other people know you are you? With imperfect human memory, how can you be sure that you are the author of your actions? 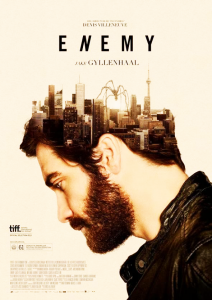 With such deep questions to draw from, there should be plenty of room for great drama in “Enemy,” a film based on the novel “The Double” by Jose Saramego. The film loses its way near the beginning. Jake Gyllenhaal does an excellent job in the dual roles of Adam Bell, a college history teacher, and Anthony Claire, a little known actor. Mélanie Laurent and Sarah Gadon are just as compelling as Bell’s girlfriend and Claire’s wife respectively. The bright lights and muted colors of the film create a striking atmosphere, but there are some annoying distractions. Rather than dealing exclusively with the tension caused by the sameness of two men so alike they have the same scars, the film inexplicably adds a spider theme not present in the book. Spiders show up in annoying and unexpected places in the film — in Gyllenhaal’s dreams and in real life. Their use in the film seems tied to Anthony Claire’s wife, suggesting that she is trying to entrap him in her web, but the execution is silly and campy. Ultimately it detracts from what is otherwise a very strong film.